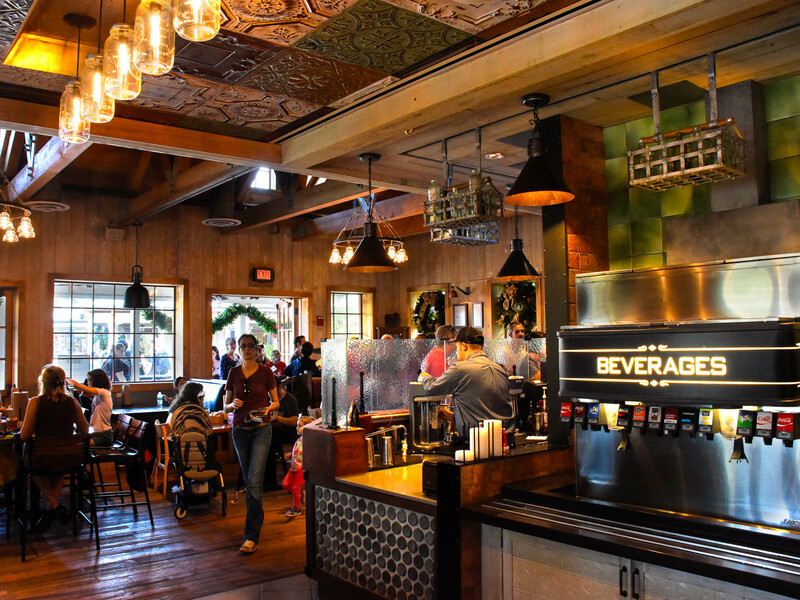 A little over a year ago we covered some of the things we thought were exciting and new at Disney Springs as it made the transition from Downtown Disney to the new and improved Springs. We know that the actual transition is going to take several years, if it's ever really finished, but thought it would be fun to re-visit Disney Springs to see what's happened in the last year. There's a gaping blank spot where Disney Quest used to be. 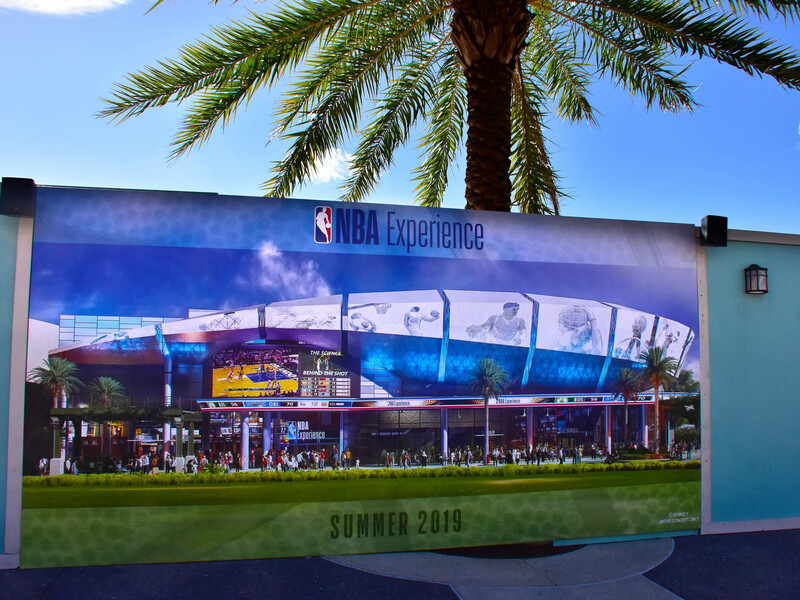 The construction screens are up, and the build has started for the new NBA Experience. This new venue might be kind of interesting. Opening in 2019, the NBA Experience will host interactive games and immersive experiences. And of course, there will also be retail space and a restaurant. 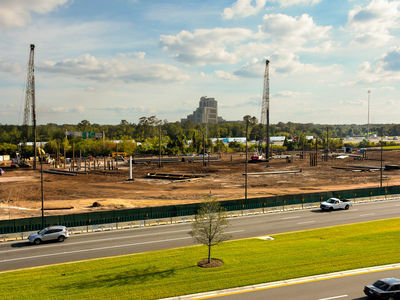 "We are inspired by the design of the new building and the energy that it will bring to the West Side of Disney Springs," said Senior Vice President of Disney Springs and ESPN Wide World of Sports Complex Maribeth Bisienere. Disney Quest is gone, but in its place (opening summer 2019) will be the NBA Experience. Photo by Bonnie Fink. 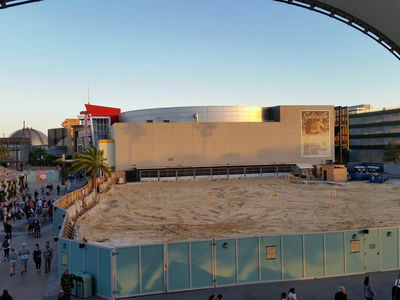 A blank slate is what's left where Disney Quest used to be, making room for the new NBA Experience. Photo by Donald Fink. 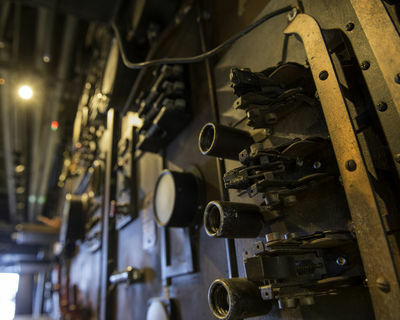 The Edison is themed after a 1920s-era power plant that might have been found in southern California. Photo courtesy Patina Restaurant Group. You may remember the backstory of Pleasure Island, and how it was founded by Mr. Pleasure, but did you know that about the time he established his sail making business, he also decided that the island needed its own power plant? So he built one. Today Mr. Pleasure's old power plant has been newly re-purposed into a 1920s power-plant-themed restaurant featuring classic American food, cocktails, and live entertainment. The original building where The Edison now stands was most recently the location of the Adventurer's Club and BET Soundstage. 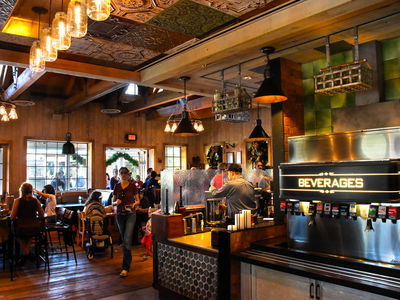 The opening of The Edison marks a renaissance of sorts of the old Pleasure Island area of Downtown Disney, and we think it signifies a new and more vibrant Disney Springs as a whole. Not to mention we like that 1920s industrial, almost steam-punk look. The first building sat empty for quite a long time, but we think that with the revival of Pleasure Island into The Landing, and the creation of restaurants like The Edison, there won't be any vacant buildings this time. We think Disney has it right. Not long before The Edison opened, Alan Dalinka was able to take a hard hat sneak peak tour of the facilities, and you can read what he had to say here. The new building at The Landing near the old bridge to the West Side is The Edison and Maria & Enzo's. Maria & Enzo's is actually two restaurants. There's a full service facility featuring Italian cuisine and a quick service trattoria, serving Sicilian pizza, sandwiches, and pastries. Photo by Bonnie Fink. It's hard to talk about one of these restaurants without mentioning the other, but in Disney Springs this year we've seen three new Italian restaurants, all with unique menus. They're located at The Landing, which is the old Pleasure Island, near the new Edison. Maria & Enzo's is a trattoria, according to Nick Valenti, CEO of the Patina Restaurant Group. A trattoria is simply a restaurant offering "simple" foods. 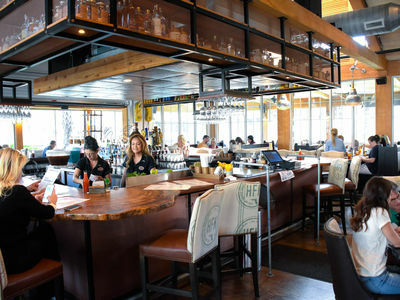 The Patina Restaurant Group is the company that is responsible for many of the unique restaurants around Disney Springs, and across the country. At Pizza Ponte, you can expect Sicilian pizza, but what you might not think of is the large selection of Italian pastries for dessert. Photo by Donald Fink. Enzo's Hideaway serves Prohibition-era cocktails with a casual menu of "hearty Roman dishes." One of their specialties is Bucatini all Carbonara (hollow spaghetti with creamy egg pancetta sauce). Time will tell the tale, but Enzo's Hideaway seems like it will quickly be a favorite with the locals. Pizza Ponte sits proudly next to The Edison along the main walkway through The Landing. This was a bit confusing for us because there's no sign outside that specifically directs you to something called "Pizza Ponte." Instead, you enter the main doors that refer to Maria & Enzo's and turn to the left. There, you'll find the quick service Pizza Ponte with its "by the slice" Sicilian pizza, sandwiches, and pastries. 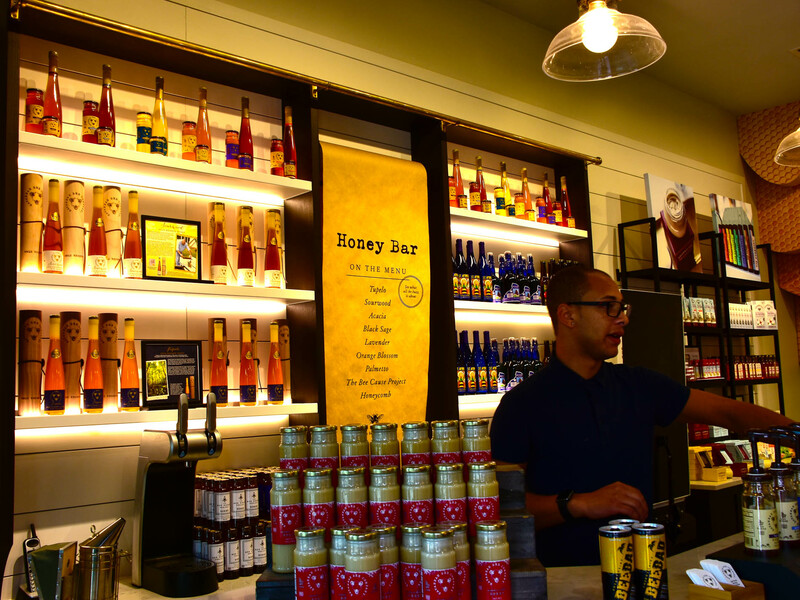 The Savannah Bee Company sells honey from all across the United States. They currently have two honeys imported from Europe: one from the southern coast of Spain and another from Austria. We've never bought honey from them, but it's on the list. A three-ounce jar is priced between $3.00 and $7.00, depending on the flavor. If you know honey, and know the difference between good honey made by respectable bees compared to those lazy insects who sell to big box stores, you'll not be worried about the price. Truthfully, there's a difference. And good, whole honey is a real treat. If you want to experience Star Wars rather than just watch it, step into The Void, the new 3D virtual reality experience at Disney Springs. Photo by Bonnie Fink. 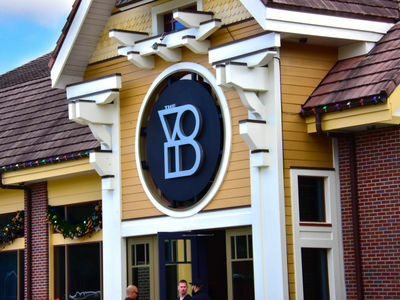 Next to Bibbidi Bobbidi Boutique is a new activity called The Void. Think of Disney Quest gaming, in 3D virtual reality, but mostly Star Wars. We haven't been in this venue, nor do we have much experience with virtual reality, but think about it. You can go to places you've seen in the Star Wars movies. See, feel, smell, and experience the places you've seen on the screen. Alan Dalinka posted a recent update of Star Wars on both coasts on Mouseplanet. 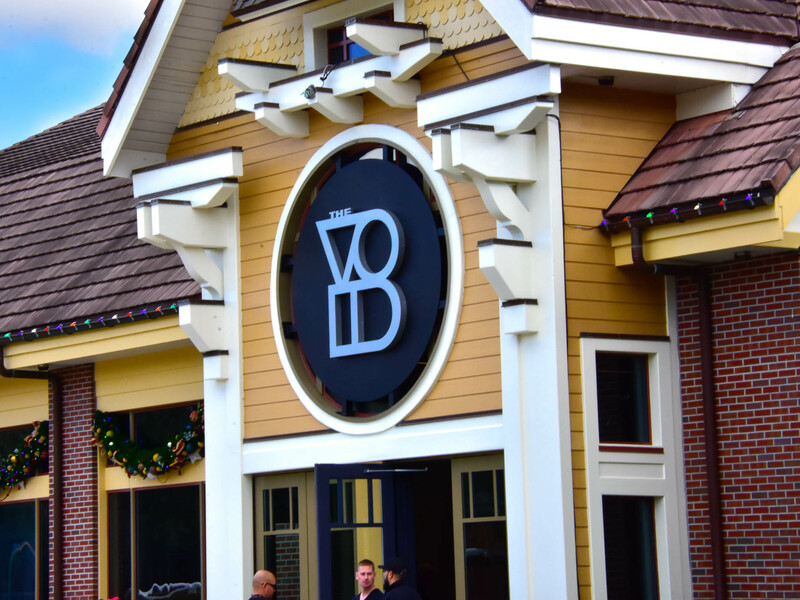 He made special mention of The Void at Disney springs marketplace. While the complete article is more about Star Wars as a whole, there's a description about The Void too. You can read about it here. 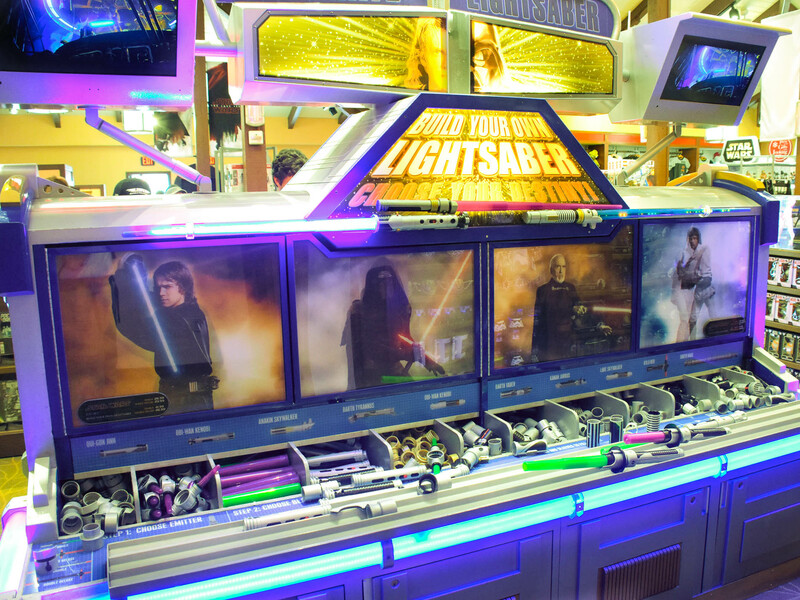 You can build your own Lightsaber at the Star Wars Trading Post in the Marketplace, Disney Springs. Photo by Donald Fink. You might think we mean "Star Wars Galactic Outpost," located in the West Side, which has been there since the last Star Wars movie, The Force Awakens. This one is new. It's in the Marketplace near Disney's Pin Traders. What you'll find here is, of course, Star Wars collectibles, apparel, and toys. Pretty much what you would find at the Star Wars Galactic Outpost in the West Side. It just adds convenience to your Star Wars shopping. We don't know if this is new, but from reading social media, a lot of people don't know that Disney Photo Pass has a studio inside the guest services building in Marketplace. It's adjacent to the Co-Op. What's new and unique here is that there are a large number of virtual backdrops. You stand in front of an LED screen that contains the background scene for your pictures and the photographer selects a backdrop to be included with the photo. At least, that's how we understand it. Your scene could be from Aladdin, Beauty and the Beast, or Pirates of the Caribbean, to name a few. The list of choices for backdrops is quite large. 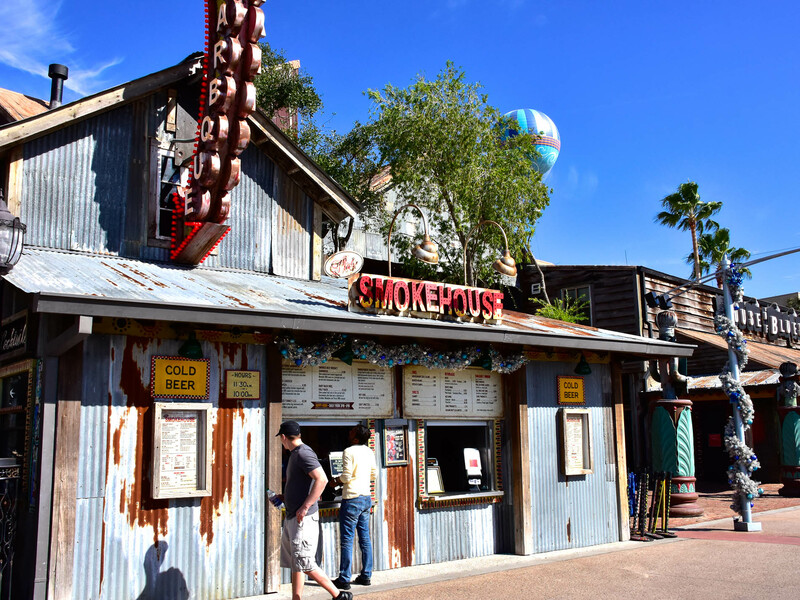 The Smokehouse is the quick service part of House of Blues. If you want some good BBQ this is the place to go. Photo by Bonnie Fink. Not exactly new, but more recent than House of Blues, is the take-out restaurant called Smokehouse BBQ. It's a quick service restaurant located in front of House of Blues, between the main restaurant and the gift shop. There's outdoor seating available behind and to the side of the restaurant. Enjoy your coffee at Starbucks West side. Photo by Donald Fink. We probably spend half our Disney Springs time, or more, at one of the Starbucks. 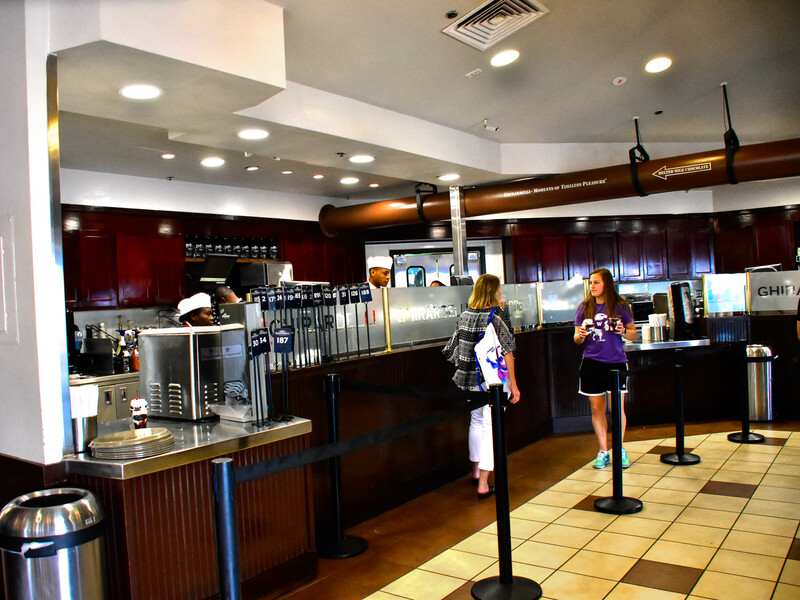 As retired folks, we like a certain routine on days when we don't have much going, and a quick trip down to Starbucks for a cup of coffee, usually accompanied with a chocolate from Ghirardelli, is just what we need. 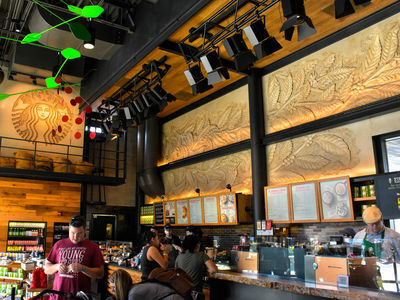 When Starbucks opened in the West Side, we told anyone who would listen that this was the best Starbucks ever built, and we still get that feeling when we walk in the door. Just in case you're wondering, Starbucks didn't pay us to say that, although it kinda sounds that way. 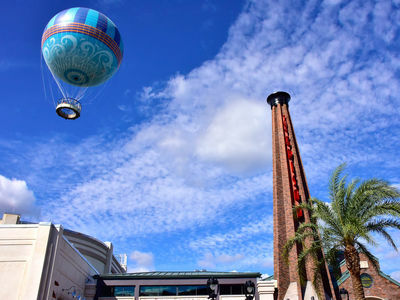 Characters in Flight balloon allows you to get a bird's eye view of Disney Springs. Photo by Bonnie Fink. Characters in flight is still in the West Side next to Starbucks. They have a new balloon. The thing is, the new Balloon doesn't have any actual characters on it like the old one. Are they planning a name change, or is this going to be one of those famous Disney backstories, where years from now young people scratch their heads and try to figure out why the balloon ride is called Characters in Flight? 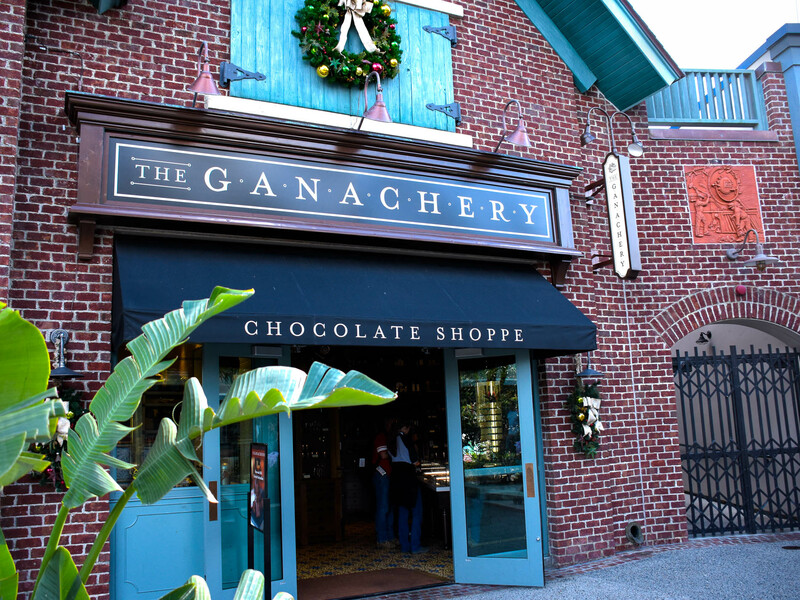 The Ganachery offers incredible chocolates for you to enjoy. Photo by Donald Fink. 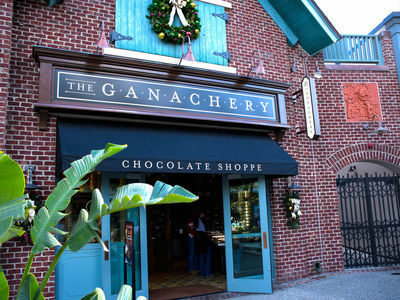 The Ganachery is located across the street from Paradiso 37. This is a one-of-a-kind chocolate store. 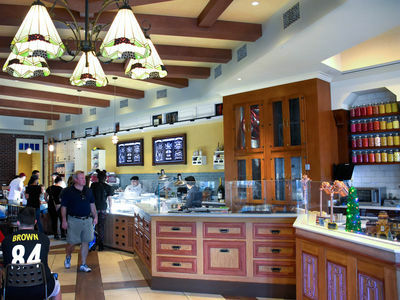 It is a Disney store, and as a result, the recipes for the chocolates were created by prominent Disney chefs. You'll may not find more expensive chocolate at Disney, but you'll probably not find better chocolate either. A single piece of these confections will get your attention price-wise, but your taste buds will take notice too. Gelato, Sorbetto, Floats, Shakes, Coffee and more are offered at Vivoli il Gelato. Photo by Donald Fink. The owner at Vivoli il Gelato makes her home in Florence, Italy. If you've ever tried the gelato in pretty much any store in Italy, you might understand what you can expect here. She also has a store in New York City, in the Macy's building. There's a dark chocolate gelato here that reminds us of a really rich mousse. If you like chocolate and you're going to try one scoop of gelato here, this is the one. Chef Art Smith's Homecomin' menu has all the comfort food you could ask for. Photo by Donald Fink. 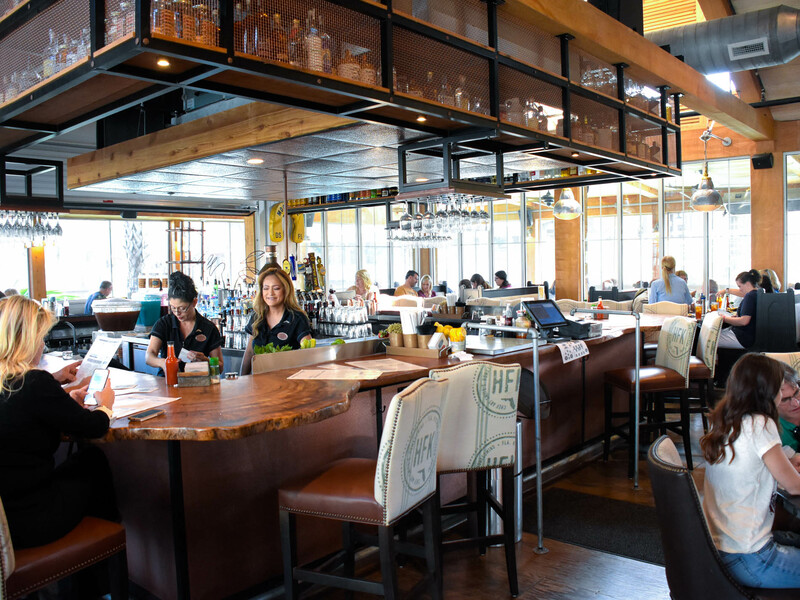 A restaurant that's become one of our favorites in the last year is Chef Art Smith's Homecomin'. This is American cuisine, meaning that you can get some seriously good fried chicken here. Don't be afraid to walk away with food still on your plate though. The portions are big enough to satisfy nearly everyone. We've been here a couple of times since it opened, for lunch and for dinner, always trying something different with each visit. It's always been good food. Seems to be well run too. We've never had a long wait, although we usually had reservations, which is a good practice anywhere on Disney property. Blaze Fast-fire'd Pizza for Pizza to-go, or eat in. Photo by Donald Fink. Blaze Fast-fire'd Pizza continues to make a good pizza. 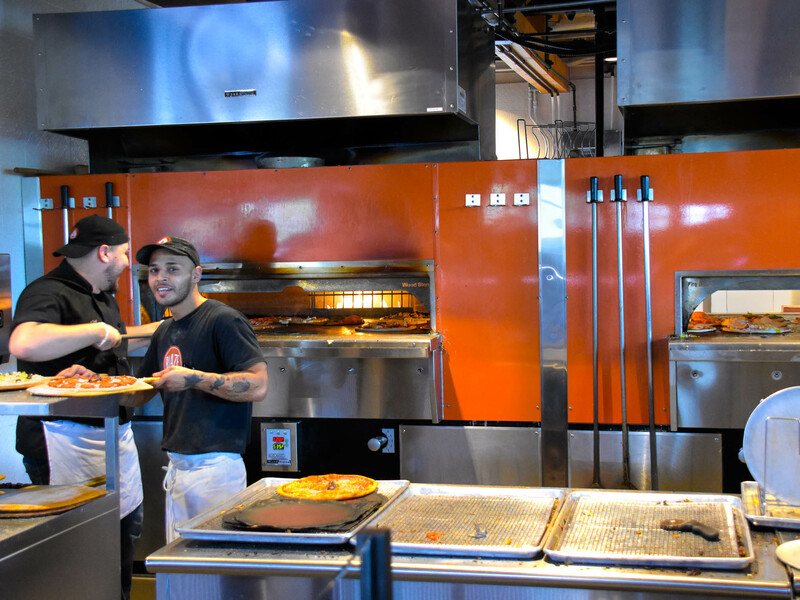 They use a seriously hot (530 degrees Fahrenheit) oven, so a pizza is ready in just a couple of minutes. And they continue to make it just like you want. D-luxe Burger has gourmet burgers, hand cut fries, and gelato shakes. Photo by Donald Fink. The best burger on Disney property is at D-Luxe Burgers. We've eaten here a couple of times, never straying from the basic hamburger or cheeseburger. We'll usually get a burger each, and not be able to finish it. The meat seems to be better quality than most hamburgers, and it's usually cooked to a medium temperature, which makes it juicy. Be ready for a mess when you dig in. The fries are hand cut—not that hand cutting makes them taste better—but they do taste better than most. A medium order of fries seems to go a long way so we usually split the fries. Chapel Hats has a great assortment of fun hats. Photo by Bonnie Fink. 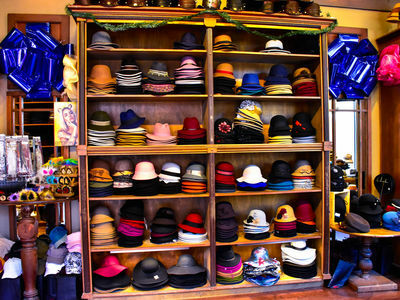 Chapel Hats is a must-see place if you're into hats. They carry practical hats, like Don's favorite Tilly hat, but they also sell a large variety of more stylish and fanciful head attire. 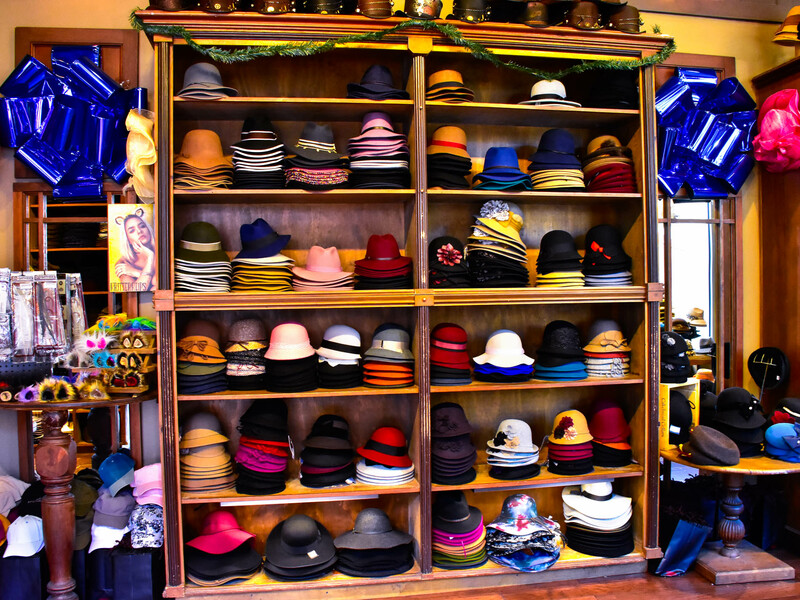 If you have any inclination of owning interesting and unique, high quality head wear, stop in and have a look. 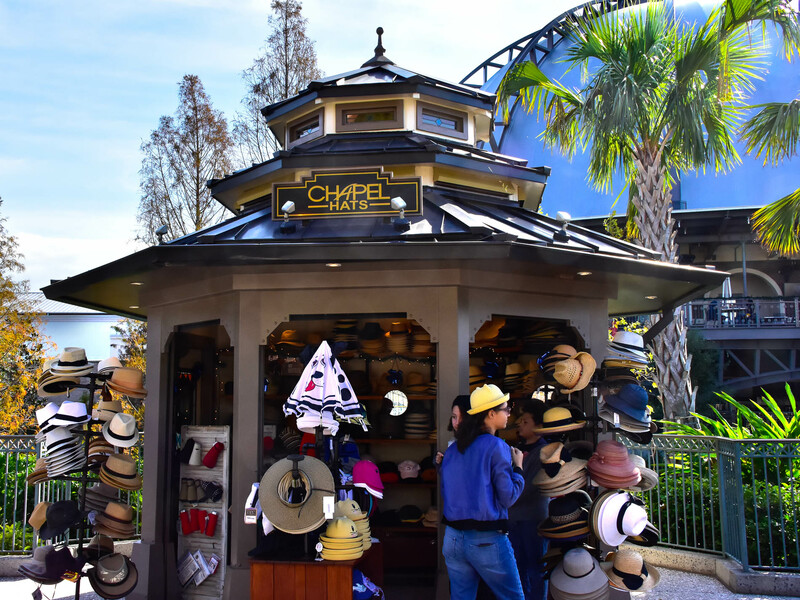 Chapel Hats has a store and an outdoor Kiosk. Photo by Bonnie Fink. 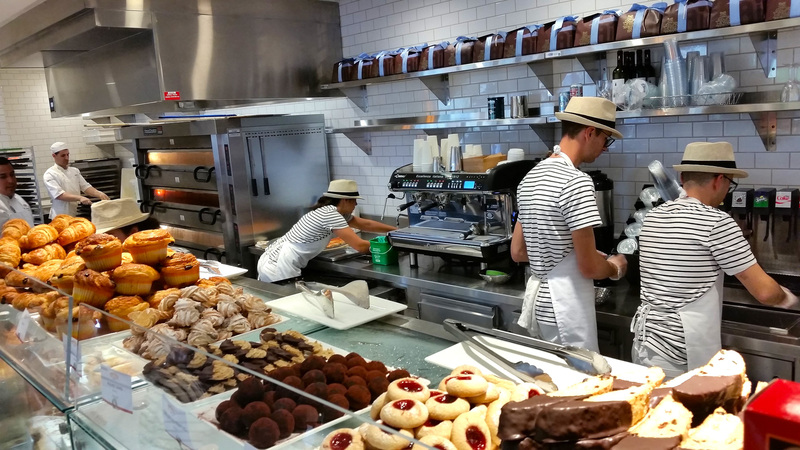 Besides delicious desserts, Amorette's Patisserie also offers sandwiches. There is seating inside and out, which is new. Photo by Donald Fink. Amorette's is still here. Extra seating has been added to both the outside and inside of the shop. 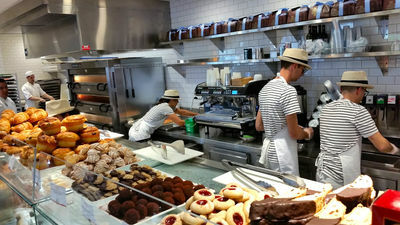 They've also started serving sandwiches in addition to their great baked confections. 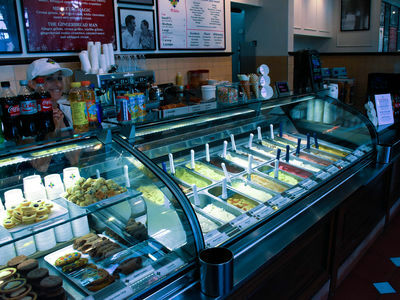 At Ghirardelli Ice Cream and Chocolate Shop you can get ice cream to go, or they will bring it to your table. Photo by Bonnie Fink. Ghirardelli ice cream is our comfort food. We find special occasions to go there and have ice cream. And of course, the chocolate isn't bad either. We were hoping that Ghirardelli would get a new store with the new improved Disney Springs; either a second location in the West Side or a bigger, fancier store in the Marketplace. So far there's been no mention of any changes. Too bad too, because Ghirardelli gets really busy. If you're looking for a great sandwich, this is your place. Photo by Bonnie Fink. 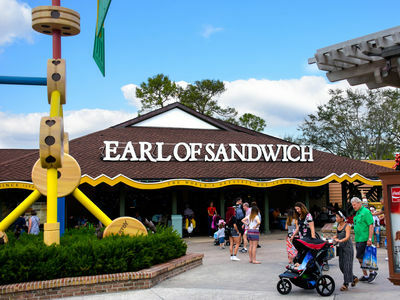 A few years ago some friends of ours were visiting from New Mexico, and talked us into stopping at Earl of Sandwich for lunch. We were living in Florida and were supposed to be experts on all things Disney, but we'd never been to this particular quick service restaurant for a meal. Not only was this one of the most reasonably priced meals on Disney property, it was easily one of the best. Our favorite sandwich? A few years ago, they introduced a holiday turkey sandwich, which consisted of turkey, dressing (stuffing), cranberry sauce, and gravy. It's a little on the messy side, but well worth it in terms of good taste. Apparently, the holiday turkey was not only popular with us because not long afterward, they started making it available year-round. When you stop in at another Earl of Sandwich, you'll have to make do with something else though. Disney Springs seems to be the only place we've been able to find the popular holiday turkey. One of several entrances to the largest World of Disney Store in the world. Photo by Bonnie Fink. World of Disney is unquestionably the granddaddy of all shopping places for Disney things. This store goes on forever, and if you can't find a Disney product here, it most likely doesn't exist. It was Disney's original intention to have an expanded, bigger-than-everywhere-else Disney shopping experience here at this store, and it would seem to us that they have succeeded. There are probably lots of folks who have a bit of time left on their vacations who decide to come over to Disney Springs before heading home. 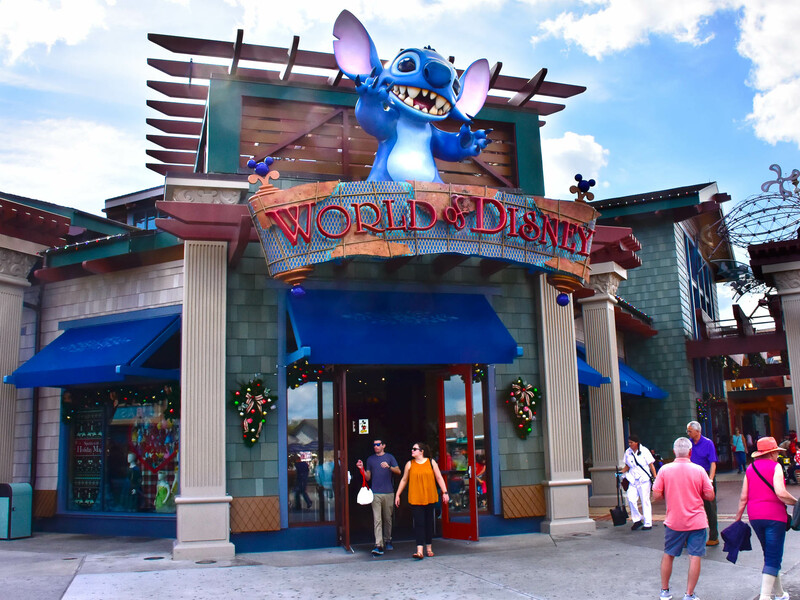 With a store like World of Disney, you can get in some last-minute shopping and pick up something you might have seen in a park but didn't buy. 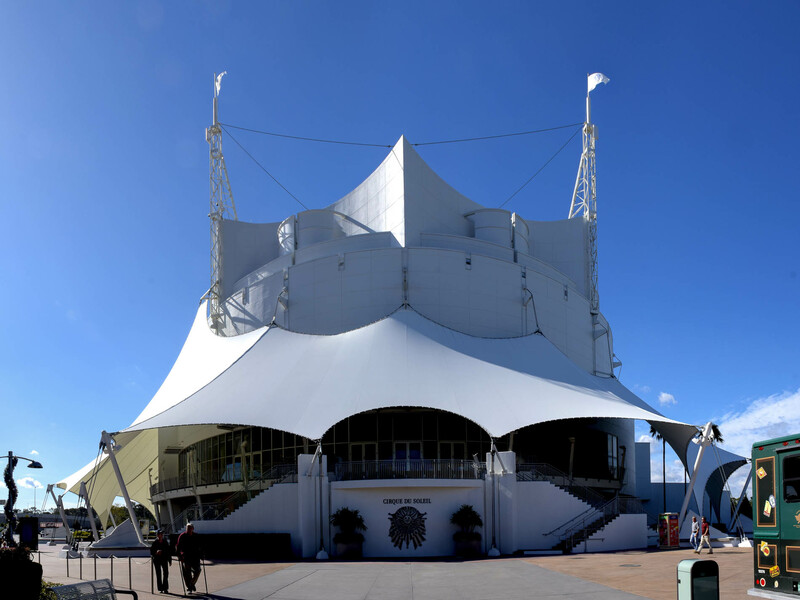 Cirque Du Soleil's "La Nouba" gave its last performance on December 31, but a new show will debut sometime in 2018. Photo by Donald Fink. The last performance of La Nouba, from Cirque du Soleil was New Year's Eve, 2017. The fate of the show was more or less in limbo, but Disney recently shared that a new show would soon be announced from Cirque du Soleil. Details aren't out yet, and indeed they are still in the planning, but the idea seems to be that a new show will pay homage to Disney's rich history of animation. Daniel Lamarre, President and CEO of Cirque du Soleil Entertainment Group, said "We are incredibly inspired by Disney's immense creative universe. We are convinced that bringing Disney's magic to life on stage will touch audiences and bring them back to their childhood." We've seen this performance a few times, and enjoyed other performances by Cirque du Soleil in other locations. We have no doubt that when Cirque du Soliel and Disney collaborate and build a new show, it'll be worth the wait. You can keep an eye on Mouseplanet—especially Alan Dalinka's weekly updates—for information when the new show opening is announced. A new parking garage is going in across from the Lime Garage. Photo by Donald Fink. There's a new parking structure under construction across the street from the Lime garage, near Marketplace. This couldn't come at a better time. It seems that the Lime garage fills to capacity almost every weekend, and certainly every evening during the holidays. The Orange garage is not far behind. As Disney Springs gets more popular, this issue will amplify. Make no mistake about it, Disney did a good thing by building the two five-level garages, and their decision to keep the parking free has probably gone a long way toward making Disney Springs a popular destination for locals. But two structures aren't enough. The third structure will help quite a bit, but it probably won't be enough either. Any bets on whether the old lot five by Cirque du Solil becomes a multi-story garage at some point in the future? We realize that this article reads more like a Disney Springs commercial, but keep in mind that it is not intended as a critical review. We spend a lot of time at Disney Springs (probably more time than we do in the parks). After all, it's easy to get to, parking is usually good except on weekend evenings, and we can find some of our favorite indulgences here. Our go-to place is Starbucks in the West Side. The other places are there for special occasions. With the addition of the Orange and Lime parking garages, and with the construction of the new parking structure across the street from the Marketplace, we expect that access to Disney Springs will only get better in the future. And of course, that's probably the idea. Disney has put a lot of effort into making a great place to shop and spend time, and we think it's paying off for them in a big way. As locals and Disney fans, we think of Disney Springs first when we're thinking about dinner, coffee, or even just a stroll in the evening.